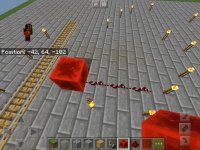 In worlds of the Old type, redstone ticking only occurs within the central 96 x 96 blocks. The active area does not depend on the player position nor the Simulation Distance setting. Block updates, on the other hand, work normally. 1. Create a world with the Old type. 2. 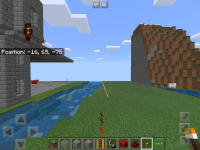 Place a redstone torch with a redstone dust beside it, within 32 blocks of any edge. Expected results: The torch powers the redstone dust. 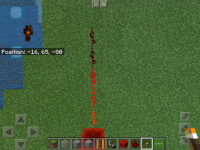 Actual results: The redstone dust is unpowered. Started an old world type with experimental gameplay enabled when it was first released, now with the prior and latest update redstone wont update. So all buildings and devices that used to function no longer update properly. Taking it out and rebuilding it doesn't work either. I have tried to copy and export it, but the new files wont update either. Switching it to infinite world type fixed the issue, but this doesn't help me still use my old world type. 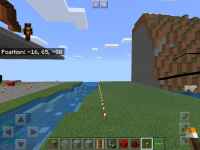 MCPE-36864 Redstone won't work at the edge of the landscape in old worlds. MCPE-40655 Redstone system can't work normally on the old world type. MCPE-43817 Redstone will not receive/transmit power.